This article is about the tournaments of the Middle Ages. For tournaments in general, see tournament. A tournament, or tourney (from Old French torneiement, tornei),[a] was a chivalrous competition or mock fight in Europe in the Middle Ages and Renaissance (12th to 16th centuries). It is one type of hastilude. Old French tournment was in use in the 12th century, from a verb tornoier, ultimately Latin tornare "to turn". The same word also gave rise to tornei (modern English tourney, modern French tournoi). The French terms were adopted in English (via Anglo-Norman) by 1300. The Old French verb in origin meant "to joust, tilt", but it came to refer to the knightly tournament more generally, while joster "approach, meet" became the technical term for jousting specifically (also adopted in English before 1300). By the end of the 12th century, tornement and Latinized torneamentum had become the generic term for all kinds of knightly hastiludes or martial displays. Roger of Hoveden writing in the late 12th century defined torneamentum as "military exercises carried out, not in the knight's spirit of hostility (nullo interveniente odio), but solely for practice and the display of prowess (pro solo exercitio, atque ostentatione virium)." The application of the term tournament to competition in games of skill or sports in general dates to the mid-18th century. Medieval equestrian warfare, and equestrian practice, did hark back to Roman antiquity, just as the notion of chivalry harked back to the rank of equites in Roman times. There may be an element of continuity connecting the medieval tournament to the hippika gymnasia of the Roman cavalry, but due to the sparsity of written records during the 5th to 8th centuries this is difficult to establish. It is known that such cavalry games were central to military training in the Carolingian Empire, with records of Louis and Charles' military games at Worms in 843. At this event, recorded by Nithard, the initial chasing and fleeing was followed by a general mêlée of all combatants. Documentation of equestrian practice during the 9th to 10th centuries is still sparse, but it is clear that the tournament, properly so called, is a development of the High Middle Ages. This is recognized by medieval sources; a chronicler of Tours in the late 12th century attributes the "invention" of the knightly tournament to an Angevin baron, Geoffroi de Preulli, who supposedly died in 1066. In 16th-century German historiography, the setting down of the first tournament laws is attributed to Henry the Fowler (r. 919–936); this tradition is cited by Georg Rüxner in his Thurnierbuch of c. 1530 as well as by Paulus Hector Mair in his De Arte Athletica (c. 1544/5). A pattern of regular tournament meetings across northern France is evident in sources for the life of Charles, Count of Flanders (1119–27). The sources of the 1160s and 1170s portray the event in the developed form it maintained into the fourteenth century. Tournaments centred on the mêlée, a general fight where the knights were divided into two sides and came together in a charge (estor). Jousting, a single combat of two knights riding at each other, was a component of the tournament, but was never its main feature. The standard form of a tournament is evident in sources as early as the 1160s and 1170s, notably the Life of William Marshal and the romances of Chrétien de Troyes. Tournaments might be held at all times of the year except the penitential season of Lent (the forty days preceding the Triduum of Easter). The general custom was to hold them on Mondays and Tuesdays, though any day but Friday and Sunday might be used. The site of the tournament was customarily announced a fortnight before it was to be held. The most famous tournament fields were in northeastern France (such as that between Ressons-sur-Matz and Gournay-sur-Aronde near Compiègne, in use between the 1160s and 1240s) which attracted hundreds of foreign knights from all over Europe for the 'lonc sejor' (the tournament season). Knights arrived individually or in companies to stay at one or other of the two settlements designated as their lodgings. The tournament began on a field outside the principal settlement, where stands were erected for spectators. On the day of the tournament one side was formed of those 'within' the principal settlement, and another of those 'outside'. Parties hosted by the principal magnates present were held in both settlements, and preliminary jousts (called the vespers or premières commençailles) offered knights an individual showcase for their talents. On the day of the event, the tournament was opened by a review (regars) in which both sides paraded and called out their war cries. Then followed a further opportunity for individual jousting carried out between the rencs, the two lines of knights. The opportunity for jousting at this point was customarily offered to the new, young knights present. The two teams stand ready; each side has 24 knights with clubs, each with a banner-bearer (Ms. fr. 2693 56v/57r, King René's Tournament Book). There is a central spectators' box for the four judges, and one on each side for the ladies; inscribed over the boxes is plus est en vous, the motto of the Gruuthuse family of Bruges. The tournament in progress (René d'Anjou), only the banners of Bourbon and Brittany are left in the field, the individual knights' banners are seen to the right. Melee (/ˈmeɪleɪ/ or /ˈmeleɪ/, French: mêlée [mɛle]; in English frequently spelled as mêlée or melée) is a modern term for a type of mock combat in medieval tournaments. The "melee" was the "mass tournament" where two teams of horsemen clashed in formation. The aim was to smash into the enemy in massed formation, with the aim of throwing them back or breaking their ranks. Following a successful maneuver of this kind, the rank would attempt to turn around without breaking formation (widerkere or tornei); this action was so central that it would become eponymous of the entire tradition of the tourney or tournament by the mid-12th century. The Middle High German term for this type of contest was buhurt (adopted in French as bouhourt); some sources may also make a distinction between melee or mass tournament and buhurt, as the latter could refer to a wider class of equestrian games not necessarily confined to the formal tournament reserved to nobility. [clarification needed] Some sources[who?] distinguish between the buhurt as more playful and the turnei as, while still nominally "mock combat", much closer to military reality, often leading to fatalities. The Old French meslee "brawl, confused fight; mixture, blend" (12th century) is the feminine past participle of the verb mesler "to mix" (ultimately from Vulgar Latin misculāta "mixed", from Latin miscēre "to mix"; compare mélange; meddle, medley). The modern French form mêlée was borrowed into English in the 17th century and is not the historical term used for tournament mock battles. [clarification needed] The term buhurt may be related to hurter "to push, collide with" (cognate with English to hurt) or alternatively from a Frankish bihurdan "to fence; encompass with a fence or paling"). 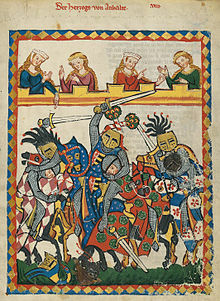 Tournaments often contained a mêlée consisting of knights fighting one another on foot or mounted, either divided into two sides or fighting as a free-for-all. The object was to capture opposing knights so that they could be ransomed, and this could be a very profitable business for such skilled knights as William Marshal. The melee or buhurt was the main form of the tournament in its early phase during the 12th and 13th centuries. The joust, while in existence since at least the 12th century as part of tournaments, did not play the central role it would acquire later (by the late 15th century). There is no doubting the massive popularity of the tournament as early as the sources permit us to glimpse it. The first English mention of tourneying is in a charter of Osbert of Arden, Lord of Kingsbury of Warwickshire, which reveals that he travelled to Northampton and London but also crossed the Channel to join in events in France. The charter dates to the late 1120s. The great tournaments of northern France attracted many hundreds of knights from Germany, England, Scotland, Occitania and Iberia. There is evidence that 3000 knights attended the tournament at Lagny-sur-Marne in November 1179 promoted by Louis VII in honour of his son's coronation. The state tournaments at Senlis and Compiègne held by Philip III in 1279 can be calculated to have been even larger events. Aristocratic enthusiasm for the tournament meant that it had travelled outside its northern French heartland before the 1120s. The first evidence for it in England and the Rhineland is found in the 1120s. References in the Marshal biography indicate that in the 1160s tournaments were being held in central France and Great Britain. The contemporary works of Bertran de Born talk of a tourneying world that also embraced northern Iberia, Scotland and the Empire. The chronicle of Lauterberg indicates that by 1175 the enthusiasm had reached the borders of Poland. Despite this huge interest and wide distribution, royal and ecclesiastical authority was deployed to prohibit the event. In 1130 Pope Innocent II at a church council at Clermont denounced the tournament and forbade Christian burial for those killed in them. The usual ecclesiastical justification for prohibiting them was that it distracted the aristocracy from more acceptable warfare in defence of Christianity. However, the reason for the ban imposed on them in England by Henry II had to have lain in its persistent threat to public order. Knights going to tournaments were accused of theft and violence against the unarmed. Henry II was keen to re-establish public order in England after the disruption of the reign of King Stephen (1135–1154). He did not prohibit tournaments in his continental domains, and indeed three of his sons were avid pursuers of the sport. Tournaments were allowed in England once again after 1192, when Richard I identified six sites where they would be permitted and gave a scale of fees by which patrons could pay for a license. But both King John and his son, Henry III, introduced fitful and capricious prohibitions which much annoyed the aristocracy and eroded the popularity of the events. In France Louis IX prohibited tourneying within his domains in 1260, and his successors for the most part maintained the ban. As has been said, jousting formed part of the tournament event from as early a time as it can be observed. It was an evening prelude to the big day, and was also a preliminary to the grand charge on the day itself. In the 12th century jousting was occasionally banned in tournaments. The reasons given are that it distracted knights from the main event, and allowed a form of cheating. Count Philip of Flanders made a practice in the 1160s of turning up armed with his retinue to the preliminary jousts, and then declining to join the mêlée until the knights were exhausted and ransoms could be swept up. But jousting had its own devoted constituency by the early 13th century, and in the 1220s it began to have its own exclusive events outside the tournament. The biographer of William Marshal observed c.1224 that in his day noblemen were more interested in jousting than tourneying. In 1223, we have the first mention of an exclusively jousting event, the Round Table held in Cyprus by John d'Ibelin, lord of Beirut. Round Tables were a 13th-century enthusiasm and can be reconstructed to have been an elimination jousting event. They were held for knights and squires alike. Other forms of jousting also arose during the century, and by the 14th century the joust was poised to take over the vacancy in aristocratic amusement caused by the decline of the tournament. It is a vexed issue as to what extent specialized arms and armour were used in mêlée tournaments. A further question that might be raised is to what extent the military equipment of knights and their horses in the 12th and 13th centuries was devised to meet the perils and demands of tournaments, rather than warfare. It is, however, clear from the sources that the weapons used in tournaments were initially the same as those used in war. It is not by any means certain that swords were blunted for most of the history of the tournament. This must have changed by the mid 13th century, at least in jousting encounters. There is a passing reference to a special spear for use in jousting in the Prose Lancelot (c. 1220). In the 1252 jousting at Walden, the lances used had sokets, curved ring-like punches instead of points. The Statute of Arms of Edward I of England of 1292 says that blunted knives and swords should be used in tournaments, which rather hints that their use had not been general until then. The tournament had a resurgence of popularity in England in the reign of the martial and crusading king, Edward I (1272–1307) and under his grandson, Edward III (1327–77), yet nonetheless the tournament died out in the latter's reign. Edward III encouraged the move towards pageantry and a predominance of jousting in his sponsored events. In the last true tournament held in England in 1342 at Dunstable, the mêlée was postponed so long by jousting that the sun was sinking by the time the lines charged. The tournament survived little longer in France or Burgundy. The last known to be held was at Bruges in 1379. That same year the citizens of Ghent rioted when the count of Flanders announced a tournament to be held at their city. The cause of their discontent was the associated expense for them. By using costumes, drama and symbolism, tournaments became a form of art, which raised the expenses for these events considerably. They had political purposes, to impress the populace and guests with their opulance, as well as the courage of the participants. Loyalty to a lord or lady was expressed through clothes and increasingly elaborate enactments. Tournaments also served cultural purposes. As the ideals of Courtly Love became more influential, women played a more important role in the events. They were often held in honour of a lady and they participated in the playacting and symbolism. Edward III of England regularly held tournaments, during which people often dressed up, sometimes as the Knights of the Round Table. In 1331, the participants of one tournament were all wearing green cloaks decorated with golden arrows. In the same year one was held at Cheapside, in which the king and other participants dressed as Tartars and led the ladies, who were in the colours of Saint George, in a procession at the start of the event. His grandson, Richard II, would first distribute his livery badges with the White Hart at a tournament at Smithfield. Mythology and storytelling were popular aspects of tournaments. An example of this is the tournament in 1468 that was organized by Charles the Bold to celebrate his marriage with Margaret of York. The tournament was supposedly at the bidding of the 'Lady of the Hidden Ile'. A golden tree had been erected with all the coats of arms of the participating knights. They were dressed like famous figures from legend and history, while their squires were dressed as harlequins. A notable example of an elaborate costume was that of Anthony of Luxembourg. Chained in a black castle, he entered the lists. He could only be freed with a golden key and approval of the attending ladies. In Florence, the military aspect of the tournaments were secondary to the display of wealth. For a tournament honouring his marriage to Clarice Orsini, Lorenzo de Medici had his standard designed by Leonardo Da Vinci and Andrea del Verrocchio. He also wore a large amount of jewelry, including the famous Medici diamond 'Il Libro'. Royalty also held tournaments to stress the importance of certain events and the nobility's loyalty. Henry VII of England and Elizabeth of York presided over a series of tournaments when their son Henry was created Duke of York. These tournaments were noted for their display of wealth. On the first day, the participants showed their loyalty by wearing the King's colours on their bodies and the Queen's colours on their helmets. They further honoured the royal family by wearing the colours of the King's mother, Margaret Beaufort, on the next day. In 1511, at the court of Henry VIII of England, a tournament was held in honour of Catherine of Aragon. Charles Brandon came out of a tower which was moved onto the battlefield, dressed like a pilgrim. He only took off his pilgrim's clothes after the queen had given him permission to participate. The decline of the true tournament (as opposed to the joust) was not a straightforward process, although the word continued to be used for jousts until the 16th century forced by the prominent place that tourneying occupied in popular Arthurian romance literature. ^ Enéas, c. 1150, ultimately from Latin tornare (Skeat); Medieval Latin torneamentum is back-formed from Old French (OED), e.g. Reims Synod, Canon 4 (1157), and Lateran Council, Canon 20 (1179). ^ For the reconstruction, see Crouch. ^ The motto plus est en vous (meer is in u ) goes back to a tournament between Jean III de Gruuthuse and Jean de Ghistelles on 11 March 1393. Octave Delepierre, Précis des annales de Bruges (1835) 38f. René of Anjou's contemporary Louis de Gruuthuse himself was a famous competitor in tournaments during the 1440s. ^ Crouch, David (2006). Tournament. A&C Black. p. 47. ISBN 9781852855314. Retrieved 1 April 2018. ^ Mortimer 2008, pp. 88–89. ^ Mortimer 2008, p. 93. ^ Gillespie, James L. (1997). The Age of Richard II. p. 132. ^ Weightman, Christine (2012). Margaret of York. Blackwell. p. 31. ^ Frieda, Leonie (2013). The Deadly Sisterhood. Weidenfeld & Nicolson. p. 48. ^ Weir, Alison (2013). Elizabeth of York. Vintage Books. p. 299. ^ Ives, Eric (2004). The Life and Death of Anne Boleyn. Blackwell. p. 10. J. Bumke, Höfische Kultur: Literatur und Gesellschaft im hohen Mittelalter (Munich, 1986) English Translation by Thomas Dunlap: Courtly Culture: Literature and Society in the High Middle Ages, New York: overlook Duckworth, 2000, ISBN 0-7156-3273-6, section 4.3 "Tournaments". Crouch, D (2005), Tournament, London . ——— (2005), Deeds of Arms: Formal Combats in the Late Fourteenth Century, Highland Village, TX: The Chivalry Bookshelf . J. Vale, Edward III and Chivalry: Chivalric Society and its Context, 1270-1350 (Woodbridge, 1983). Wikimedia Commons has media related to Tournaments.